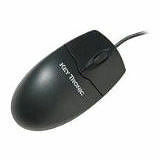 This optical mouse will glide across your desk without having to use a mouse pad. It can be used on almost any surface because it uses sensors to record the movement optically. With no mouse ball, there are no parts to get dirty, so cleaning is a snap.